It was getting late. We had just visited three attractions in Alta. And we headed towards inner Finnmark, to the heart of Sapmi. It is 130 km from Alta to Kautokeino. There isn’t any traffic to speak of, and in theory, you can speed up a notch. The reindeer can suddenly pop up out of nowhere. Even if you think the reindeer is looking at your car, the herbivore doesn’t faze the danger. It may just as well kamikaze in front of your vehicle. 30 km from Kautokeino you have the option of forking to Karasjok. We did, and drove to Jergul Asttu which is 37 km from Karasjok. Living in the Arctic is all about finding an Oasis in one way or the other. Jergul is one of these oasis. Ten days inside the month of August there is no Midnight Sun anymore. At midnight it was not pitch dark, the moon was shining, and there was a hazy mist on the slow running river. It was a magical night. 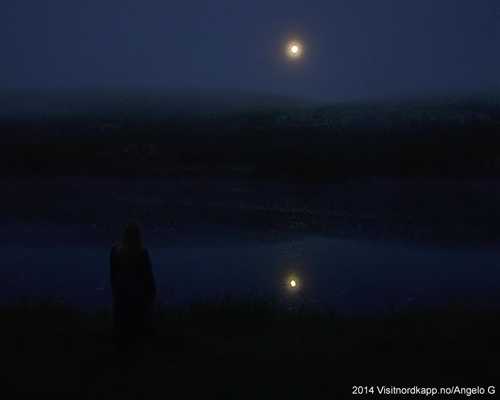 Sometimes the concept of Night and Day is a little blurred among the people of the Midnight Sun. The hours can sometimes be longer at night, and people stay up until the early morning sun. This was one of those nights. At Jergul Asttu I met some distant cousins that I hadn’t seen for a few years; Lillian, Dokka, and Arne. 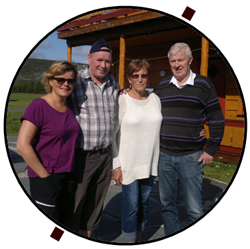 Together with one of the family owners of Jergul Asttu, Ms. Berit Alette Mienna, we small talked into the night. The magical night turned to a mystical night as the moon stood directly behind the river from our seats. It was completely silent. Lillian said it was a perfect moment for a joik. Berit is a joik artist. She is a recording artist and she teaches joik. On our Diamonds of the Arctic Tour 2014 we had been listening for a joik opportunity. Our joiking moment had come. 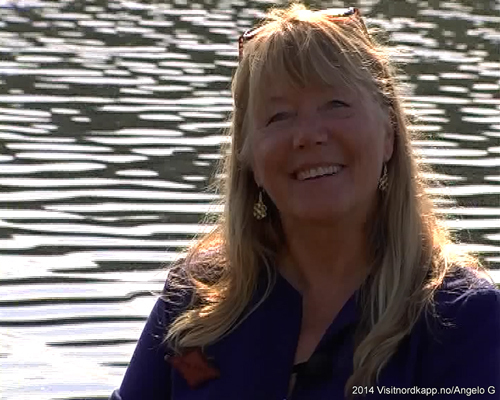 As Bruce Springsteen did, we went down to the river … and Berit sang four wonderful joiks into the reflective dusk. She did a joik about her mother, father, eldest sister and the swans. In this area, most of the joiks are personal joiks. You can joik your family members. A person has his or her own joik. Footballer Robbie Fowler has his own joik. Berit also emphasized that you can joik a specific mountain, river, bird, animal, anything, even a building. Joik is the traditional way to sing, communicate, show feelings and reminisce. You joik what is close to your heart. This makes the joik so vigorous. The joiks in the north are different from the ones in the south. The joik, in fact, have dialects. The trained ear can hear the tiny cues revealing where you come from and what family you belong to. It is another way of communicating without exact words, like Saami costumes. Anybody can joik. It is the soul of life around you.